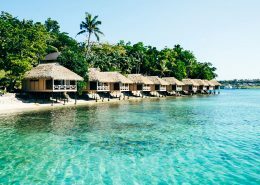 Iririki is conveniently located on its own 69 acre tropical island in Port Vila harbour, with a private beach, Day Spa, variety of restaurants and fabulous off shore snorkeling and water activities. Successfully appeals to both couples and families. 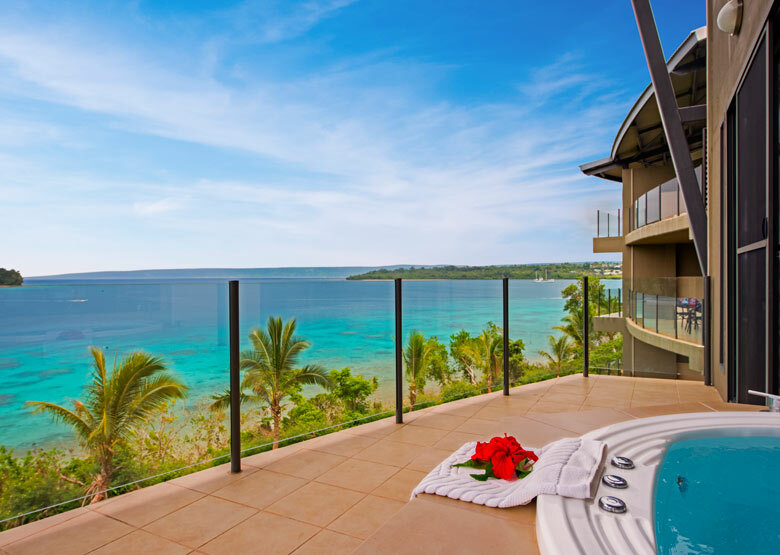 Iririki Island Resort is a stunning property situated exclusively on a 69 acre private island in the heart of Port Vila harbour, jjst 3 minutes from the township’s numerous shops, bars, cafes and restaurants – accessible via a complimentary 24-hour ferry service. 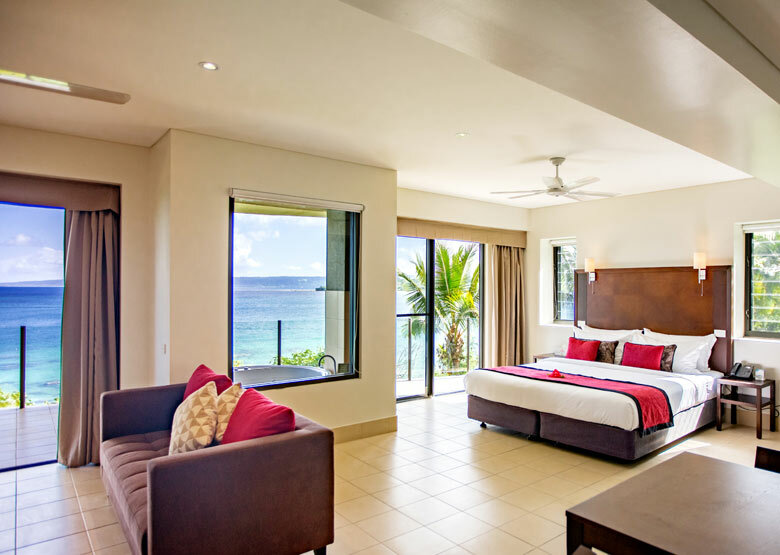 Iririki offers 136 guest rooms in two very distinct styles – from the traditional Island Fa-re (bungalows) to the spacious self-contained Deluxe Pool View, Ocean View & Penthouse Suites. All rooms are provided with 24-hour room service as well as catering for romantic balcony dinners. Bars & restaurants are all within an easy stroll to the various locations around the resort. 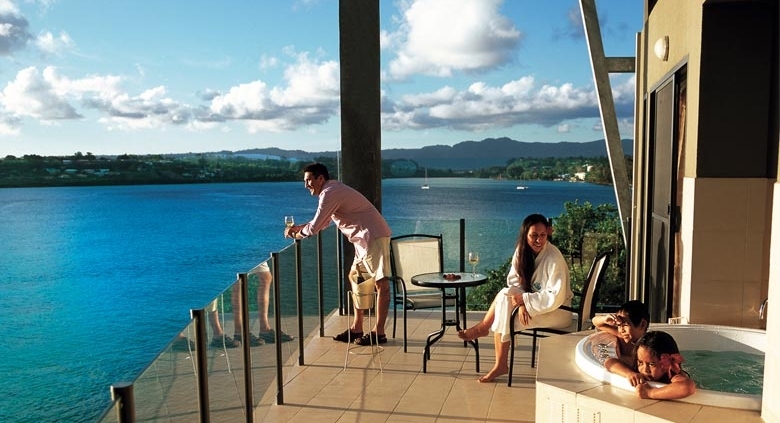 Azure Restaurant specialises in fresh seafood & local produce and offers sweeping views across Port Vila harbour, making for a romantic & memorable experience. Guests can be entertained at Iririki’s new Jewel Casino or relax poolside enjoying daily happy hour & live entertainment every evening at Infinity Bar & Cafe. The Sunset Pool, Bar & Grill is located in the Leisure Precinct and is ideal for a leisurely lunch or snack, or a tropical cocktail at any time of the day. On the island, Iririki provides a range of facilities for everyone and activities for all ages. The island’s leisure precinct is a sensational recreation area available to guests of all ages and features a 4-tier swimming pool with swim-up bar, gymnasium, games room, kids club and two full-sized tennis courts. The island also features a 130m private beach, volleyball net, water sports centre and great snorkelling in its surrounds. Rejuvenate your mind, body and soul at Iririki Spa. Set in a secluded and peaceful setting on the plateau above the resort, the professional & experienced staff offer a range of individualizes treatments for both men and women. Iririki offers a true island experience with the convenience of easy access to Port Vila town. Location: Port Vila. Accessed by a 24-hour complimentary 3 minute ferry service. Iririki Island Resort is set on a 69 acre private island, in Port Vila harbour. 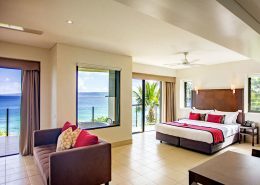 Accessed by a short 3 minute ferry ride (operates 24-hours a day), this resort is easily accessed, close to the town of Port Vila, has a choice of restaurants & bars & offers lots of activities. It has something for everyone! 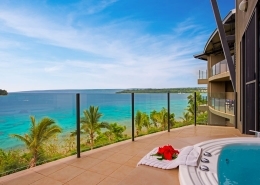 Iririki Island Resort is located in Port Vila in Vanuatu. Getting to Iririki is easy! Vehicle transfer time is approximately fifteen minutes from Bauerfield Airport & then a 3 minute ferry ride across to the island. See map below for exact island location. Iririki is truly magical. Such a beautiful resort to visit. I highly recommend it. The people are so friendly and welcoming. There is so much to do on the actual resort itself; water sports, casino, nightly entertainment (singing, fire shows, traditional dancing, bonfire and historical talks) and so much more. The pool and bar is great, clean and greatly serviced. We stayed in the waterfront room (on the cliff), such a beautiful view. The food was so delicious, there was so much variety and they even give you the option the have a private candlelit dinner on the actual beach.